It’s tough to beat the beauty of Kootenai Country Montana. Even while touring in an automobile the scenery and wildlife are splendid. But imagine taking one of three gorgeous bicycle loops around our majestic Northwest Corner of “The Last Best Place.” Time seems to slow down, and the mountain peaks change with every bend in the road. Wildlife sightings are more up close and personal. The smells of wildflowers are in the spring air, and eagles whistle and soar above you. The Scenic Tour of the Kootenai River, or STOKR, was originally dreamed up by Greg and Susie Rice of Libby. This event usually takes place the 2nd full weekend in May. Approximately 450-riders sign up for this tour. The bike journey is in support of Kootenai Valley Partners Habitat for Humanity, and it takes about 2-STOKR’s to build one home. Ten homes have been built for those in need, and this says a lot about our community. Just another example of how we are all getting better together! The Headquarters for this tour is the Venture Motor Inn, "Libby’s Boutique Motel", and the starting point at Fireman’s Park where the Chamber of Commerce is located just behind the Venture Inn. Sponsors include The Venture, Plum Creek Timber Company, U.S. Army Corps of Engineers, Friends of Scotchman Peak Wilderness, Montana Wilderness Association, and many other supporters that show the generous character of the Libby community. There are two days of touring and three choices for rides. 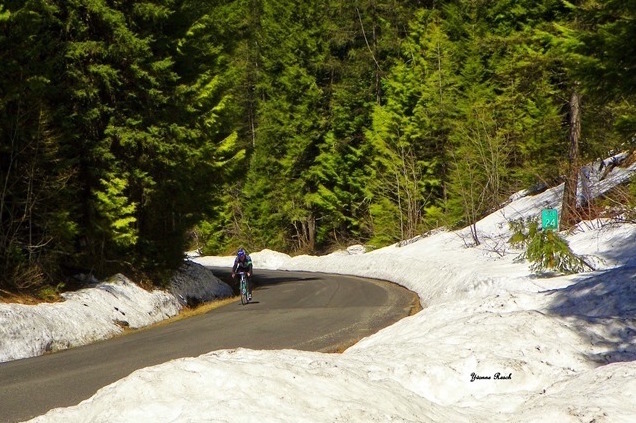 The first day, usually the second Saturday in May, there is a 98-mile ride that begins in Libby and winds its way west along the Kootenai then turns up the Yaak Road (508) along the Yaak River passing Yaak Falls. Bicyclists continue to the community of Yaak, extremely unique in its own right-with saloons named the Dirty Shame and the Yaak River Tavern. From Yaak, riders gradually climb the 4,000-foot Pipe Creek Pass and then are rewarded with incredible scenery and wildlife sighting opportunities on the 25-mile descent back to Libby alongside historic Pipe Creek where Native Americans used clays of many colors to make smoking and ceremonial pipes. There are no towns on Pipe Creek Road 68, but coming “Down the Pipe” one will see the turnoff to Turner Mountain, Libby’s “Steep, Deep and Cheap” community run ski area and the Red Dog Saloon, famous for its pizza and hospitality. Also on Saturday, there is a 45-mile ride that begins with the 98-milers as they head west along the majestic Kootenai River. This group usually stops for a short walk into Kootenai Falls, a vision quest site for the Kootenai Tribes. The falls were also mentioned in explorer David Thompson’s journals from 1806-1813 as he describes the precipitous and dangerously steep portage of canoes around the falls. These falls have been featured in films such as, "The River Wild," and more recently with the filming of "The Revenant" starring Leonardo DiCaprio. The riders hit one of the many greatly appreciated food stops and then bike the Lake Creek — Iron Creek Loop. Lake Creek flows out of Bull Lake, and the lake is named after the Bull Elk that roam that area. 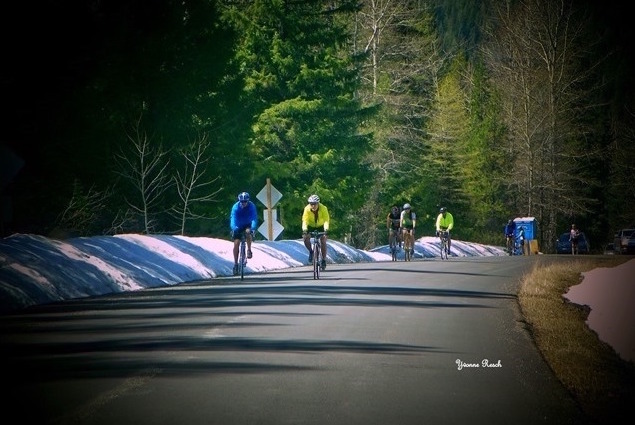 On Sunday, bikers really appreciate the 37-mile ride which also begins in Libby and heads out the old logging “Haul Road” on the south side of the river. Participants arrive at the Fisher River, and continue to follow it to where it flows into the Kootenai. This is adjacent to where David Thompson’s first trading post was built around 1809. As riders head upstream, they are treated to sightings of bald eagles, ospreys, and various species of hawks. The group crosses over Lake Koocanusa to the dam site and visitor center. Riders head south on the West Kootenai Road (228) which is known for black bear sightings, and meet up with Highway 37 again near Thompson’s Old Fort. Bicyclists often spot Great Blue Herons fishing or an otter family playing along this beautiful stretch of river on the way back to Libby. Local bike shops such as Libby Sports, have a great variety of choices of bicycles for sale and Bob is their bike repair mechanic. Owner Ardell Fuller turned 80 last fall, and is still providing overall sporting goods and up to date foul weather gear for local outdoor enthusiasts. Libby Sports Center is located at 204 West 9th Street, Libby, Montana, you may contact them at (406) 293-4641. Bad Medicine Bike Shop, and Troy Bike Shop owner Dennis Hedge’s place downstream are all willing to help in any way they can. Bryce Huck and Jordan LeCount of Bad Medicine Bikes located just over the Kootenai bridge on Highway 37 are also there for you if you have mechanical problems or need parts. Bad Medicine Bike Shop’s phone is (406) 291-4075 in case of emergency repair needs. For Bryce, who rides in this challenge, mental attitude and pacing is important. Most rewarding is the scenery, the folks, and the food stops! Bad Medicine shop carries all four types of road bikes used in these tours which include: speed; endurance, backpacking and touring. Mr. Huck quotes an old Italian Champion Bicyclist when asked what type of bike he recommends for the tour, "It doesn’t matter what you ride, as long as you ride." Well put. This event is not only about the worthwhile cause, the unbelievable scenery, the diverse wildlife and the bicyclists. It is most certainly also about the coming together of a remote, small community in Kootenai Country Montana. It’s about the original organizers Greg and Susie Rice and their generosity. It’s about the many volunteers who help with organization and execution of the event. Riders brag about the food and pie stops. Townspeople donate homemade sandwiches, cookies, pies, and pasta salads. Locals follow along the route to help those who may have mechanical problems, physical problems, or if fatigue sets in. EMT’s at Cabinet Peaks Medical Center, another sponsor, are on call. Libby Search and Rescue are always ready if needed. It is about the bike shop owners and mechanics, who will be there to help riders with emergency repairs whenever needed. It’s also about a community that is so proud of their little corner of Kootenai Country Montana, that they love to share it with you! And it is about the riders themselves too! 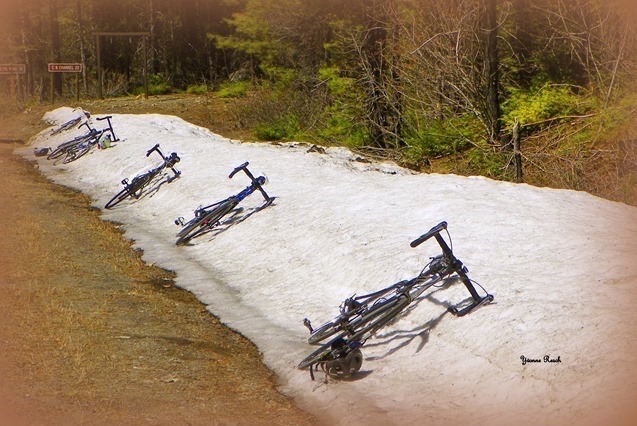 Ride the STOKR, it’s a magical journey through a heavenly corner of Kootenai Country Montana!